The Wagner 0518080 Control Spray Max HVLP Sprayer is a multi-purpose sprayer that can be used to paint doors, windows and furniture. 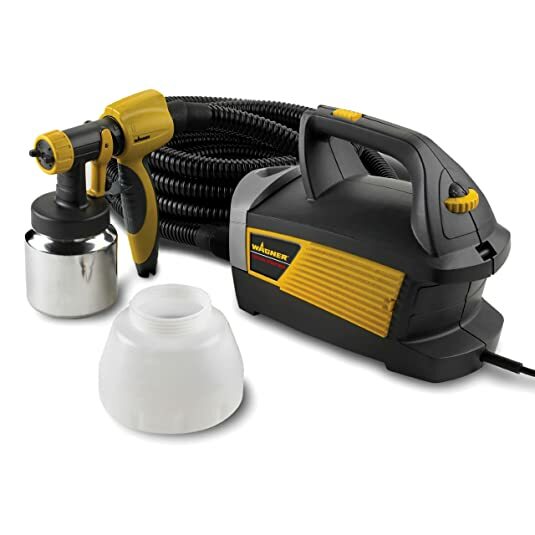 It comes with various impressive features like air pressure control, metal spray gun and two stage turbines that make it easier to paint with latex and thinner materials like lacquers and stains. Its variable spray patterns and flexible hose enable painters to work according to their convenience. It also weighs pretty light hence easy to handle and comes with two filters that enable even and neat results. 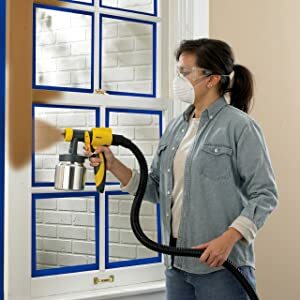 Whether you want to give a new look to your room by painting its walls or looking forward to reviving the fading paint of front deck, Wagner 0518080 Control Spray Max HVLP Sprayer is the best option you have got! Avoid paint rollers and messy brushes and get the job done in the most flawless manner possible with the use of this sprayer. It’s an ideal tool for do-it-yourselfers and homeowners who are looking for an easy way to accomplish the task of painting. This sprayer provides users with an advanced level spraying experience, allowing them to enjoy flawless paint application. You will love the way this unit works due to its increased versatility and unmatchable features. Many people have been using Wagner 0518080for years and enjoying its perfect results. People who have tried this unit praise it for its vast array of functionalities and affordability. 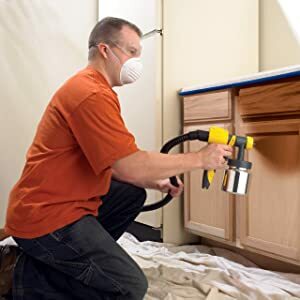 This paint sprayer is pretty good and an excellent choice for pros as well as beginners to get done with their painting jobs. One of the many things, you will immediately notice when holding this unit for the first time is that it is quite lightweight hence pretty easy to handle. Its front door facility has a lock that allows users to replace the liquid effortlessly. That’s it, as simple as possible! You won’t need to go through hours of preparation to get the job started. It’s indeed a fantastic tool; beginners can use it effortlessly while pros can put this little magic unit to a higher use by utilizing it to its fullest potential. When it comes to spraying liquids of different viscosity flawlessly, many paint sprayers fail. But that’s not the case with Wagner 0518080! The powerful 570W two-stage HVLP turbine enables this unit to spray liquids of varying viscosities pretty impressively. It means this sprayer is capable of working with thin as well as thick materials. The compatible two-stage turbine of Wagner 0518080 ensures that you can use this unit to accomplish any spraying task. High and oval profile: set air cap horizontally to enjoy this pattern. Broad and oval pattern: vertical air cap will result in this pattern. Symmetric circular pattern: diagonal air cap gives this pattern. This feature of Wagner 0518080 allows users to go thick and thin in painting as per their desires and requirements. 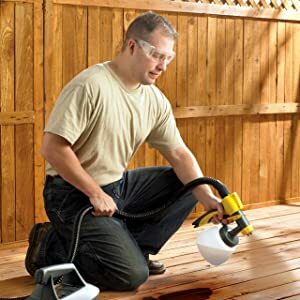 Whether it’s a big project involving a large surface or a small task requiring a detail-oriented painting, this sprayer will serve you well to attempt both tasks. You can adjust the air pressure according to the requirement of the project. This feature allows users to avoid overspray by setting the pressure level that ranges from 1.50 psi to 2.63 psi. The air hose of Wagner 0518080 is 20 feet long and pretty flexible, extending your reach for spraying. This paint sprayer doesn’t have a lot of parts hence cleaning and maintenance is not a problem. If you have used latex material, soapy water will be enough to clean the unit, but for oil-based materials, you will need mineral spirits and brush to clean it properly. You won’t face any problem while cleaning this tool because everything rinses out smoothly. Wagner 0518080 comes with an incredible feature of lock-n-go at its front end that allows users to change the liquids pretty faster without creating any mess. It has two air filters that prevent dirt from ruining your project. Filters ensure that spraying goes smoothly and you enjoy uniform coating. There are no liquid limitations when using Wagner 0518080 because it allows you to fill the cup with any material, thick or thin, to enjoy desired spraying. Even if you’re a beginner or never used a sprayer before, Wagner 0518080 is perfect for you because it’s simple to setup and easy to use. Just follow its basic instructions and you are good to go! The handling is also not a problem because of its light weight. You can carry it easily for hours to get done with your projects and your hands won’t be even aching. As it doesn’t have much parts, it’s pretty easy to clean and maintain. The cleaning process doesn’t even consumes hours, in fact, hardly takes a few minutes. With Wagner 0518080, you can be quite innovative and use its different pattern options to enjoy creative spraying. Excessive overspray can ruin your project but thanks to Wagner 0518080, you won’t be experiencing this problem because it has little overspray. Wagner 0518080 has a short power cord that becomes a bigger problem when we need to spray a surface that has no power socket nearby. It gets pretty irritating to use extension every time we need to do projects that involve larger surfaces or exterior areas where long cord seems a necessity. Although Wagner 0518080’s functioning is flawless, this unit can get pretty noisy sometimes. It might be a result of uncleaned filters or high air pressure. The last drawback of Wagner 0518080 is that it’sslower when covering larger areas. Basically, the amount of paint it sprays per minute is less than what’s required to complete the big projects sooner. Using it for larger surfaces is not a bad idea if you have got sufficient time to complete the task. The majority of people who have used Wagner 0518080 has a favorable opinion about this unit despite the fact that it has some minor flaws. People with less experience of spraying were expecting this unit to be silent, but to their surprise, it wasn’t quiet at all. Pros find it as a good spray unit but not much efficient in comparison to advanced level HVLP sprayers. Whereas, beginners are of the opinion that this paint sprayer works pretty great and perfect for DIY projects. Apart from its functioning and design, users are also much satisfied with its affordability and find it pretty reasonable. Who should buy this sprayer? If you are looking for some high-end units but not willing to pay the high-end prices, get this unit as it suits your requirements and limitations pretty nicely. Those who want to spray surfaces where more control and less paint is needed must use Wagner 0518080 because it’s a spray control max HVLP sprayer. If you wish to spray cabinets, furniture, doors or fences, this unit is going to serve you the best. It’s truly ideal for home projects that involve flawless painting! Being a hobbyist, you can use this tool to get into the creative and colorful craft of spray painting. It mainly depends on your discretion to judge the performance and efficiency of this unit jointly, based on your experience. Among many significant features of Wagner 0518080Control Spray Max HVLP Sprayer, lightness and versatility are the elements that make this product remarkable in itself and outshine many other paint sprayers. Its flawless functioning and affordability have made it the first choice for beginners as well as professionals. Wagner 0518080 is not a perfect piece, but users are willing to excuse its drawbacks because of the benefits, it has got to offer. Despite the short power cable and noise it creates, Wagner 0518080 is highly recommended for multi-purpose usage. This unit has been benefitting do-it-yourselfers as well as professionals to complete their paint spraying projects effortlessly. If you have always found spraying or painting hard or challenging, you can buy Wagner 0518080Control Spray Max HVLP Sprayer now to see how this tool makes the painting more accessible, exciting and faster.